Big Blue was honored by an anonymous philanthropist who gifted this sculpture. There is excitement today. There is joy. There is mystery. Someone has stuck a pink flamingo on Big Blue's front lawn! Just in time for the Gus Macker tournament, going on this weekend right outside the gates. We are going to leave it there. 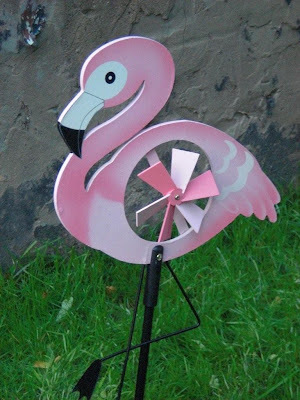 We love this pink flamingo, the look on its face. It will project just the right image to the out-of-town basketball players. They are expecting this urban experience and what do they get? This Depew/Cheektowaga experience! Ha, ha! Howard and I have been trying to figure out which neighbor is responsible. He suspects New Era Cap. I say Uniland, the company rehabbing the Dulski building across the street. In any case, isn't life in Buffalo exciting? Do other cities have this kind of intrigue? I bet they do not have it in Rochester. I wonder if it was that prankster Bashar Issa?